A wide market awaited the manufacturer... who would set purity and quality above everything else in their preparation. ~ Henry J. Heinz. Manufacturing is the production of merchandise for use or sale using labor and machines, tools, chemical and biological processing, or formulation. INDUSTRIAL DESIGN is destined to become a universal language ; for in our material age of rapid transition, from abstract, to applied, Science — in the midst of our extraordinary tendency towards the perfection of the means of conversion, or manufacturing production — it must soon pass current in every land. In short, intelligence, considered in what seems to be its original feature, is the faculty of manufacturing artificial objects, especially tools to make tools, and of indefinitely urging the manufacture. Mechanical engineering may be defined as the manufacture, installation, and repair of all kinds of machinery (including machine tools), prime movers and boilers, and engines. A wide market awaited the manufacturer of food products who would set purity and quality above everything else in their preparation. The two main purposes of mechanical engineering are: first, to design and make tools and equipment for turning out machinery required by all branches of engineering, industry, and commerce, and, second, to design and manufacture, by means of said tools and equipment. 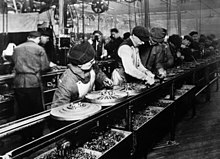 There are many branches of manufacturing industry which greatly depend for their success upon the designer's art, and it is necessary that the industrial designer should possess a knowledge of the processes of the manufacture in which his designs will be utilized, as well as of the properties and capabilities of the material to which they will be applied. We went through one of the big automobile factories to-day.... The foundry interested me particularly. The heat was terrific. The men seemed weary. Here manual labour is a drudgery and toil is slavery. The men cannot possibly find any satisfaction in their work. They simply work to make a living. Their sweat and their dull pain are part of the price paid for the fine cars we all run. And most of us run the cars without knowing what price is being paid for them.... We are all responsible. We all want the things which the factory produces and none of us is sensitive enough to care how much in human values the efficiency of the modern factory costs. The great cry that rises from our manufacturing cities, louder than their furnace blast, is all in very deed for this, — that we manufacture everything there except men; we blanch cotton, and strengthen steel, and refine sugar, and shape pottery; but to brighten, to strengthen, to refine, or to form a single living spirit, never enters into our estimate of advantages. Mechanical engineering is applicable rather to works connected with private enterprise, such as the designing and construction of steam machinery for the purposes of navigation and transportation, the adaptation of such machinery to mills and factories, the construction of water-wheels, the fabrication of materials, iron, steel, and brass, for the purposes of the engineer, the architect, and manufacturer ; and the manufacture of implements and machinery for agriculture, for mining, and for domestic purposes.